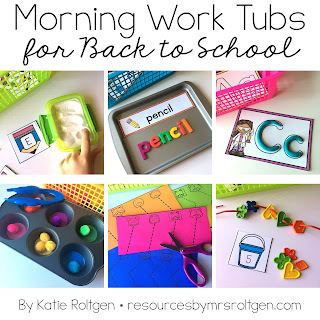 If you follow me on Facebook, you may have seen my Facebook live video where I announced that I'm adding a Back-to-School Morning Work Pack to my Morning Work Tubs Bundle. I'm pleased to announce that the pack is completed and now available! If you want more information about the tubs and want to spend some poolside or Netflix time preparing the activities, read on! Just like the other monthly packs, the back-to-school pack includes 20 activities. When creating these, I kept in mind that the activities really need to be simple enough that a sweet new kindergartener could complete them with a good amount of confidence and independence. I want you to be able to use these on Day One! I've had a few people ask me whether the activities will be appropriate for children who have no previous educational experience. In my personal opinion, I would say that for the most part, these activities would work out. As with many activities you'll be doing in the first few weeks, there might be some things they would struggle with, and that really varies child to child. I've thought back to children that I've taught who have started the year with no previous educational experiences, and I think that for the most part, they would be successful. 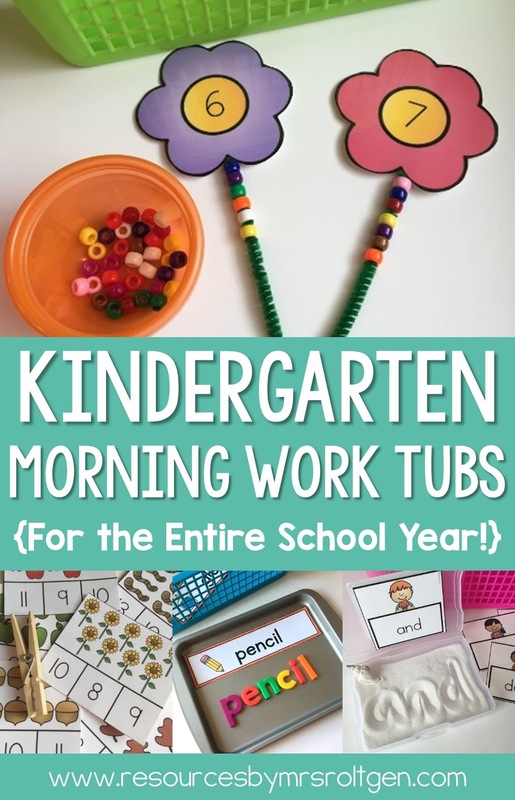 You may have to choose a couple tubs that you know for sure they'll be able to do and offer those for the first few days, such as the color sorting activities or the playdough challenge cards. Here's a peek at all 20 activities! I've added affiliate links to Amazon for any materials you see just in case you want to check them out! 1. Alphabet Playdough Mats - I hesitated when naming these "playdough mats", because there are tons of other uses for them as well! You can laminate them and have students trace, or you can have students form the letters out of mini erasers, as shown below. I love these apple erasers! 2. Beginning Sound Puzzles: These are pretty simple, and you can make the activity easier and less overwhelming by only using half of the puzzles. You could even use fewer if you want, and you can divide them among multiple tubs as well! 3. Sand Letter Writing: These are editable! You can use whichever letters you want to use. I just used sand from Hobby Lobby, and I love these little containers by these little Sistema containers for the sand. They are the most leakproof that I've used. Plus, I love the size. They're about the size of a bar of soap, and I think that having a smaller container helps keep the students on task (i.e. not drawing pictures in the sand!). Mine are from The Container Store, and they're the same price on Amazon. 4. 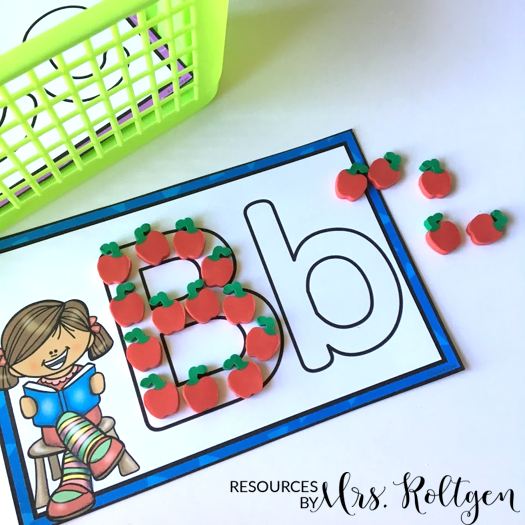 Letter Spy Mats: Kids love magnifying glasses, so I made sure to include an activity that uses one! There are four picture mats, and they have to find letters hidden in each picture. Here's the magnifying glass that I have. This set on Amazon also includes a pair of jumbo plastic tweezers, and it's a great deal! 5. School Vocabulary Cards: I have vocabulary word building activities in a few other of my monthly sets, and they've been pretty well-liked. I like these little magnetic cookie sheets because they fit in most tubs. Here's the one I have. Here are the magnetic letters that I have as well. 6. Number Puzzles: There are 1-5 versions and 1-10 versions so you can differentiate as needed! 7. Numeral Road Tracing Mats: I have had so many requests for these! Numbers 1-10 are included. I put a "Go" and "Stop" sign on each card to help promote independence with correct number formation. 8. Real-World Shape Find-and-Cover Mats: I included these because I feel that even children without a lot of school experience would be able to determine the matching real-world object for each card. You can use any manipulative to cover the cards; I used the apple mini erasers I talked about above! 9. Watermelon Puzzles: These are pretty basic, and go from one to ten. 11. Frogs and Flies: I love this activity! 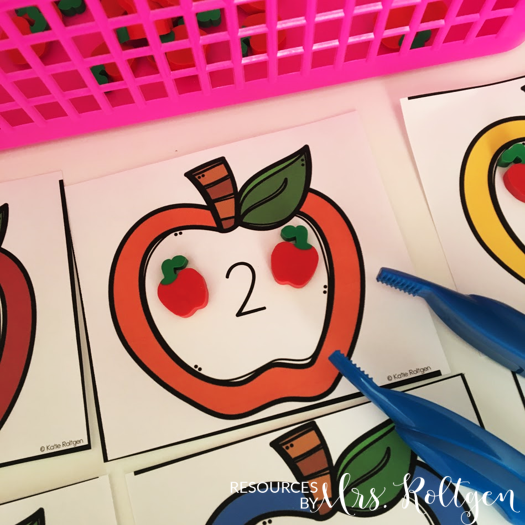 I enjoy turning simple counting activities into fine motor work. Students will use plastic links to attach the number of flies shown on the frog card. 12. Missing Number Mats: These are similar to the missing number mats in some of my other morning work tub packs. They are a little simpler, and they have fun school-themed images. 13. Beach Bucket Numbers: This activity is extremely versatile! Not only is it editable, but you can also use it as any kind of counting activity you want. I made it a fine motor activity by having students string plastic buttons onto shoelaces. You can also use plastic pony beads on pipe cleaners, jumbo beads onto shoelaces or yarn, etc. Here are the plastic shape buttons I have. Disclaimer: Some of the buttons I have didn't have large enough holes for the shoelace, so you will want to double-check before you give them to students! 14. Color-and-Cut Shapes: I realize this activity seems really simple and unconventional; however, I love it! These shapes are perfect for students to practice coloring on, and then they will cut out their shape. 15. Pom-Pom Pattern Cards: I included AB and ABC patterns for these! 16. Muffin Tin Activities: There are two options for this activity! You can do a color-sorting activity, or a counting activity as shown below. Be sure to add jumbo plastic tweezers (like these) or scooper tongs (like these) for that important fine motor component! 17. Bee Line Tracing: I love line tracing cards, if you couldn't tell! Side note: If you have trouble getting dry-erase marker off of laminated cards, try using a magic eraser. I recommend cutting them in half! 18. Cutting Lines: I really wanted to include another scissor skill activity, so I made these! Just print multiple sets and cut them horizontally twice (they print three-to-a-page). 19. School Dot Pictures: Another request I've had is to make dot marker pages. 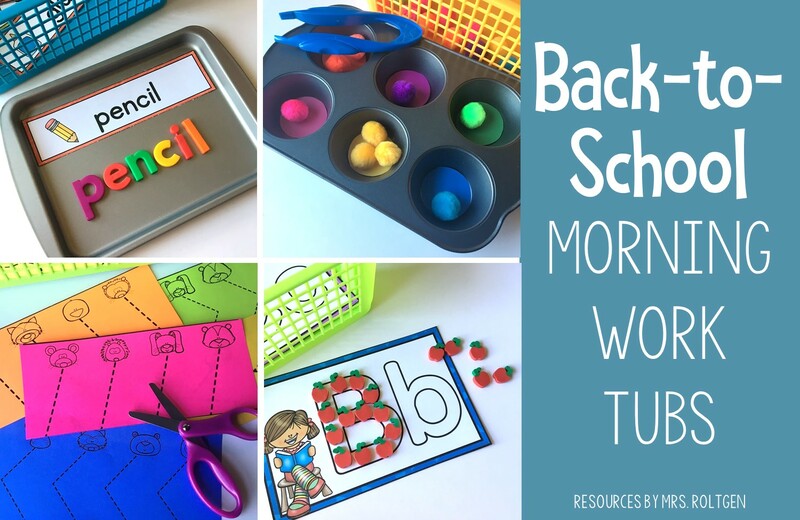 I thought they would be perfect for a back-to-school activity! These are the dot markers that I swear by. They're the only ones I've found that are truly washable and don't bleed through the paper! I've used three other brands and these are the best, IMHO. 20. Playdough Challenge Cards: I r-e-a-l-l-y like these! 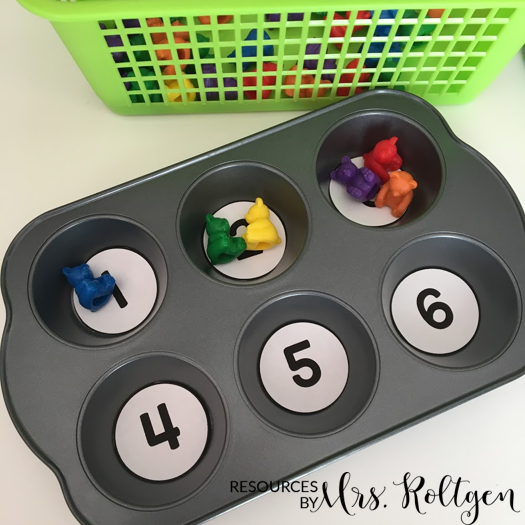 There are eight "challenge" cards, and they have students make a variety of simple, yet fun, playdough structures. My own five year-old is obsessed with these! 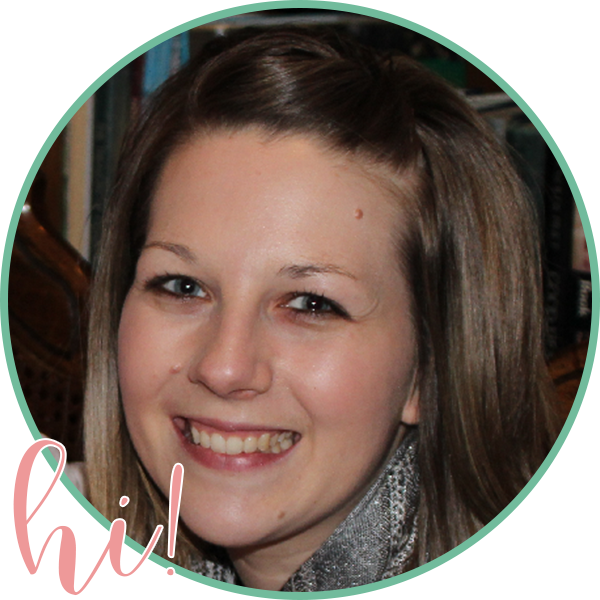 If you would like to see all of the products that I recommended above on Amazon, click here! These back-to-school tub activities are available here, or you can click on the cover image below. 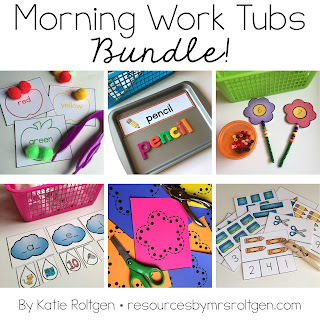 They have been added to the morning work tubs bundle, so if you own that, be sure to re-download! 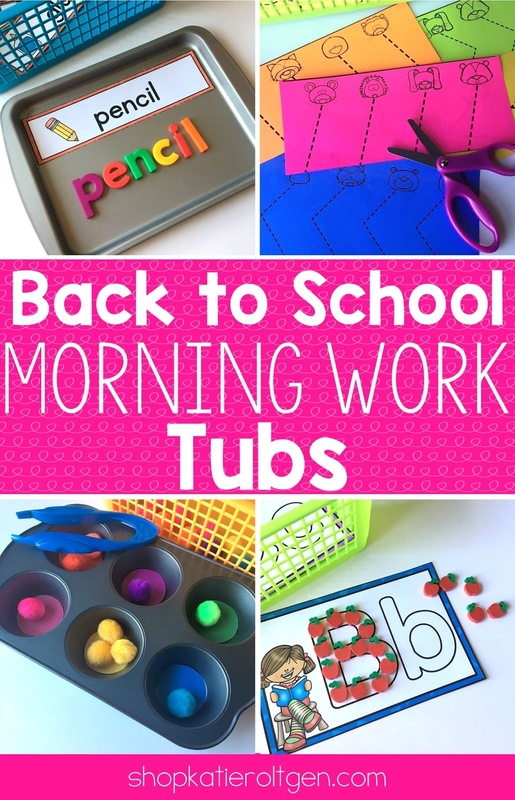 Finally, I have a Facebook group for us to discuss morning work tub storage, rotation, and more! Click here to join! I love the work that you have done. This is much creative and inspiring and I believe that it can be used well to teach children how to craft different things using papers.